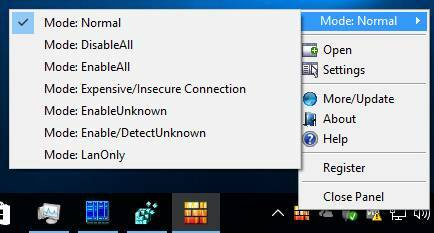 Windows 10 Firewall Control has a special Mode: "Expensive/Insecure connections". The mode is available via the TrayIcon/RightClick menu. You can use the mode while your computer is reconnected from the home/office network to a public (wireless) network temporary. The mode allows limiting the applications with the minimal vitally required programs permissions. So, all the programs marked with "Allow in 'Mode: Expensive/Insecure connections'" (see Edit Application for the details) will follow the permissions applied to the programs only. All the other programs will be disabled accessing the network. There are some exceptions made for system vital services. Without the services enabled the computer will lose the network connectivity at all. However the services connectivity is limited as well. The mode is very useful if your computer is connected to the internet via an expensive connection with by-traffic rates (mobile, satellite, etc). The mode suppresses supplemental network activity of background data transfers (Windows Update, Antivirus database update, etc). Such updates may be postponed to a more "comfortable" internet connection. Thus, the mode can limit your expenses while using specific internet connections.